Microsoft's monthly security rollups for Windows 7 have grown by 91% since the company revised the still-popular operating system's update regimen in 2016. Windows 7's security rollups, the most comprehensive of the fixes it pushes out each Patch Tuesday, have doubled in size since Microsoft revamped the veteran operating system's update regimen in 2016. 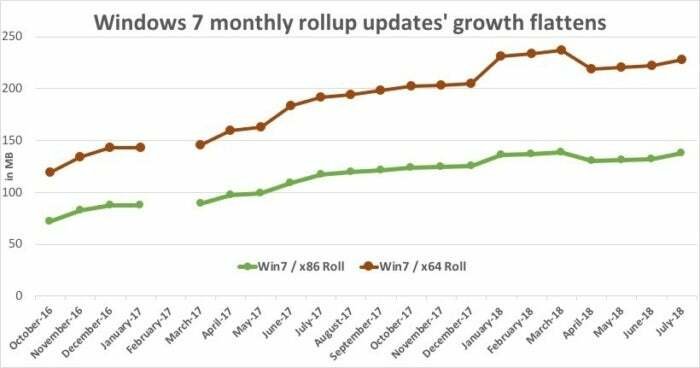 According to Microsoft's own data, what it calls the "Security Quality Monthly Rollup" (rollup from here on) grew by more than 90% from the first to the twenty-first update. From its October 2016 inception, the x86 version of the update increased from 72MB to 137.5MB, a 91% jump. Meanwhile, the always-larger 64-bit version went from an initial 119.4MB to 227.5MB, also representing a 91% increase. The swelling security updates were not, in themselves, a surprise. Last year, when Microsoft announced huge changes to how it services Windows 7, it admitted that rollups would put on the pounds. "The Rollups will start out small, but we expect that these will grow over time," Nathan Mercer, a Microsoft product marketing manager, said at the time. Mercer's explanation: "A Monthly Rollup in October will include all updates for October, while November will include October and November updates, and so on." It looks like Mercer's forecast may have been pessimistic. At the 22-update pace that Windows 7's rollups have established, the 64-bit version will weigh in at approximately 244MB by October 2018, and a year after that, as Windows 7 nears its expiration date, about 306MB. The latter would represent a 39% shortfall of Mercer's target. Likewise, the x86 edition would increase to 147MB and 186MB in 2018 and 2019, respectively, if the 22-update growth rate continues. Windows 7's rollups, the monthly everything-and-the-kitchen-sink updates, have grown by more than 90% since their late-2016 debut. By the time Microsoft retires Windows 7, its 64-bit rollup will be over 300MB. Those numbers are not only far below Mercer's 500MB maximum, but also lower than Computerworld's estimates at the end of 2017. Then, using the first 12 updates as a guide to future update bloating, Computerworld said that the Windows 7 x86 updates would balloon to 216MB and 374MB by October 2018 and October 2019, respectively. Meanwhile, the Windows 8 x64 updates would expand to about 350MB by October 2018 and a whopping 600MB by October 2019, just months shy of its retirement. The previous predictions were wildly off-base. Why? "The size of these is definitely a concern," said Chris Goettl, product manager with client security and management vendor Ivanti. "When the rollups grow to 300MB to 500MB, some companies don't have the downtime (to download and install updates that large), especially those with a global reach or to remote areas across slow connections." Microsoft issues two kinds of security updates for Windows 7 on the second Tuesday of each month: a rollup and what the company has dubbed "Security Only Quality Update" (security-only from here on). The latter includes the month's security-related patches and nothing else. Because they contain only that month's patches, they're much smaller than the same month's corresponding rollup. The 64-bit security-only for July was just 37MB and the 32-bit was an even smaller 24MB, compared to the same month's rollups of 228MB and 138MB. But only some Windows 7 machines are eligible for the smaller security-only updates: Those serviced by WSUS (Windows Server Update Services), or tools, whether third-party or Microsoft's own System Center Configuration Manager (SCCM), that rely on WSUS for content. All other Windows 7 devices, including those run by consumers and small companies, that connect via Windows Update or Windows Update for Business, are handed rollups. They do not get a choice. Overall, the security-only updates issued for Windows 7 have been about one-fifth the size of the rollup total. Only 6 of the 22 64-bit security-only updates was larger than 40MB, for example, and only 7 of the 32-bit versions broke the 20MB mark. Goettl saw security-only updates as a sop to enterprises, a bone Microsoft threw to its most important customers when it laid down the new laws. "One thing that softened the blow (of the cumulative update announcement) was that they offered the security-only bundle," Goettl said. "In Windows 10, you don't have that option." 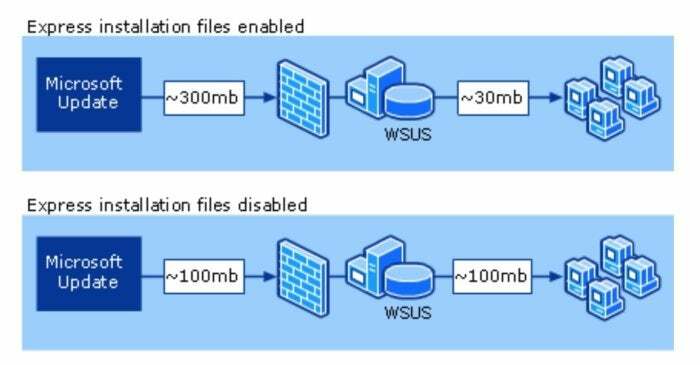 In an example Microsoft highlighted, a 100MB update resulted in 300MB downloaded to the WSUS server, but the actual amount transmitted over the local network to each client might be as little as 30MB when express installation files is turned on. With it off, the initial download to the WSUS server would be 100MB, the size of the update, but then that same 100MB would have to be delivered to client PCs across the local network. While the express feature has arguably received more attention in Windows 10 - Microsoft has publicized the feature in Windows 10 several times - it's not identical to what's in Windows 7.